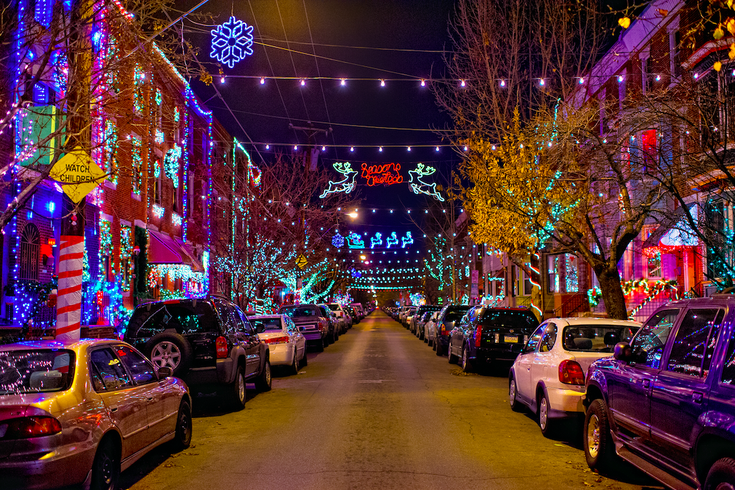 Many Philadelphia neighborhoods go all out at the holidays, creating spectacular presentations of lights and decorations. In South Philadelphia, neighbors pool resources to create amazing displays. Founding Footsteps, which offers BYOB trolley tours through Philly, launched the popular Holiday Lights Tour last winter. The decorated holiday trolley leaves from Old City, traveling to the city's most dazzling light displays – including the must-see Miracle on 13th Street and the Smedley Street Christmas Spectacular. Onboard, tour attendees can the drink wine or beer they brought along for the ride, while talented musicians play holiday tunes. For 2018, the Holiday Lights Tour has added a new stop at Dickinson Square Park, where there will be a professional photographer. The tour will also be providing pizza for attendees. This winter, it will be offered Wednesdays through Sundays, from Dec. 1 through Dec. 30. Below are the tour times. • Wednesdays at 6 p.m. and 8 p.m.
• Thursdays at 6 p.m. and 8 p.m.
• Fridays at 5:30 p.m., 6:30 p.m., 7:30 p.m., 8:30 p.m. and 9:30 p.m.
• Saturdays at 5:30 p.m., 6:30 p.m., 7:30 p.m., 8:30 p.m. and 9:30 p.m.
• Sundays at 5 p.m. and 7 p.m.
Tickets will go on sale at noon on Monday, Sept. 17. If you have a large party of 15 or more, you can call (609) 795-1776. Through Monday, Oct. 15, tickets will be $34 for adults. After, the price will increase to $38. Tickets are $30 for seniors and military and $25 for children 12 and under. The trolley holds 32 people comfortably.